Very disappointed by a chess supertournament in Bilbao. Only 7 decisive games out of 30. 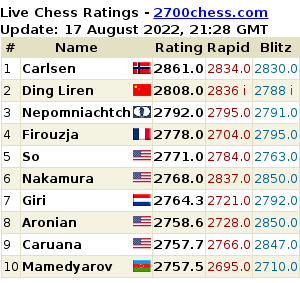 Even more, without Carlsen - who had won, and Giri - who had lost, all games were drawn! In some games the fight didn`t appeared, many games were played too lazy. The question to organizers. This event was held not in a jungles, but in European chess country - Spain. The elite players does not have enough time to recover energy and work for new ideas. Of course, we can talk about disgusting behavior of players and irresponsability of organisers. Hello! I'm glad that Chess-News give me the opportunity to explain the reasons why I left the European Championship after the 7th round. Indeed, it seems that people pay more attention to such unfortunate details than to the course of the tournament or the games themselves. 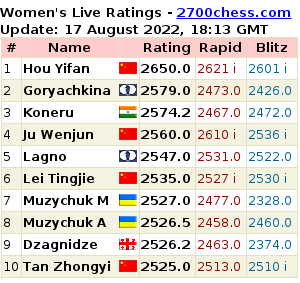 Chess-News has been informed that, from today, the games of the Women's European Championship will be broadcast with a 15-minute delay, at the request of many of the players. The competitors approached the organising committee with this request. While studying hard for my final exams and having no time to throw away at all, I simply couldn't help myself expressing my deepest disgust about the situation where a few WGM's, ex World and European Champions and strong GMs amongst them, accused my colleague from the National Team- WGM Mihaela Sandu for cheating. Garry Kasparov: "The Situation in Russia Doesn't Facilitate Intellectual Development"
М.GLUKHOVSKY: Garry Kimovich, How did you evaluate the players before the match, and how do you evaluate them now, when half of the match is practically over? "The tournament proved that the rumors stating that the classical chess is dead are exaggerated. There was a spectacular event, a lot of decisive games and so on. Moshe Slav: "We Got Kind of an Israeli-Ukrainian Team"
E.SUROV: This is Moshe Slav ladies and gentlemen. If you think that he is the President of the Israeli Chess Federation, the main organizer of the tournament, which is now held in Eilat and, as it turned out today, a great swimmer, then you are of course right. However, not everyone knows that Moshe is also the owner (or the President - how should I call that?) of the chess club Ashdod - the club which brought first surprises at the start of the European Club Cup. Could you tell us what is going on? Anatoly Karpov: "FIDE Made a Huge Mistake By Not Returning Carlsen Into the Candidate's Cycle"
The press conference held in the State Tretyakov Gallery 20.05.2012.